Since my Puck Hawgs moved up to the 'B' division of men's hockey, I've gone up against several goalies that I hadn't seen before. 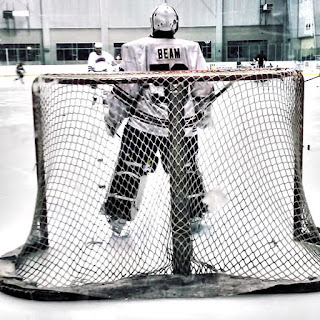 Starting last season I began to notice a goaltender named Kolby Beam and I wanted to learn more about him. His movements are quick, his rebound control is terrific and I've watched him keep his team in games where they were outshot 2-1. He often sees 40 or more shots from the Hawgs and yet every game is a battle- sometimes we don't come out on top. I am envious of his smooth transitions and sliding as I continue to try and improve that part of my own game. 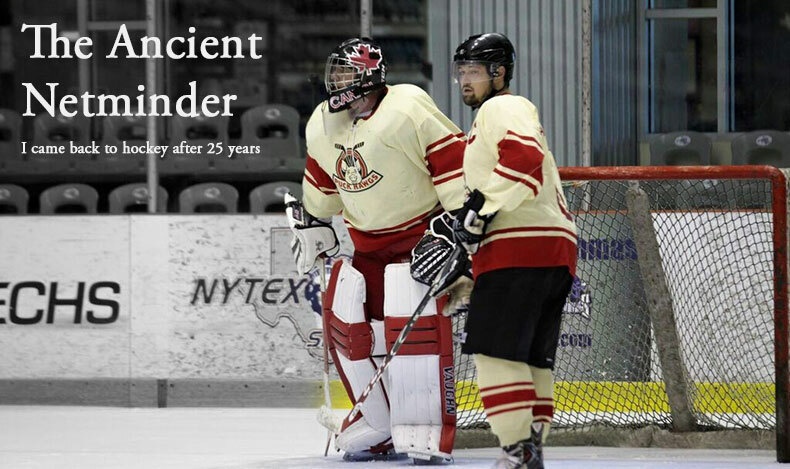 Of course he's probably 25+ years younger than I am but when it comes to on-ice competition, that can't be an excuse. I want to become as good as Kolby and hold my team in games like he often does. I sent him some questions and he was nice enough to share some of his story. TAN: Tell us about your start in hockey. Did you begin in net or when did you catch the bug? KB: I knew I wanted to play goalie since I was about 3 years old. My dad played goalie so of course I wanted to play goalie. My first tryout in Mini Mites my mom was trying to help out on all the goalie gear. She had never even touched hockey gear in her life! I ended up going on the ice without a cup. I took a shot to the nuts and so I ended playing forward my first year. I switched to goalie full time in Mites with a nice large cup! TAN: What are some of your best memories from when you started out? KB: I definitely remember my first shutout. It came in Squirt and both my parents missed it because they had to work. I told them to stop coming to my games after that! TAN: Tell us more about your playing career. I see you out on the ice a lot playing in Men's 'A' and 'B' divisions. Where else have you played? KB: I played for a few AA travel teams in the Dallas-Fort Worth area growing up. I also played on Birdville's varsity team. I'm currently under contract with University of Texas Arlington and I play with the Warriors and Chicken Lollipops beer league teams. I've probably subbed for every team in the metroplex though haha! TAN: I feel like you play a very aggressive style. How did you develop it and why does it work well for you? KB: I would say I play a pretty medium depth game honestly. My pronounced movements probably make it seem aggressive but if you watch me I tend to never leave the blue paint. I feel like the farther away from the net I am, the more I'm prone to be off-angle. Especially being pretty short you have to be square and set before you worry about anything else. TAN: Tell us about your gear. What are the reasons you like the gear you have? KB: I'm currently wearing Brians Subzero3 pads. Coming from a Reebok-style pad it took me a while to get used to them but now I would never go back! I'll probably lose an inch in the thigh rise on my next set. Brians has pretty tall thigh rises. My glove and blocker are both reebok XLTs. My glove is a 590 break which I love for my "fingers-up" glove position. I'll probably end up trying out that Sub3 glove whenever I get the chance. TAN: Who were your idols or who did you model your game after as you were learning? KB: Henrik Lundqvist! His compete level, his movements, his attitude towards the game is something I try to replicate. As a kid I also liked Belfour! TAN: Who is your favorite goalie(s) playing now and why? KB: I love Lundqvist. I love his sheer will to win and his compete level is second to none. I like Halak because he's closer to my size. Its fun to watch how the shorter goalies survive at the highest levels. Also I'm a big fan of Bernier, Talbot, and recently Nashville's backup Jussi Saros has caught my eye. TAN: Tell us about something funny that happened during a game. KB: Just yesterday actually I let in an awful goal and flung the puck into the stands. The refs weren't happy about but little did they know I was actually aiming at the guy who scored haha! TAN: As you have gotten older and spent more time in net, what is some advice you would give kids starting on goal? KB: Growing up I would always get the worst pre-game anxiety. To the point where it was affecting me and I was pretty much yanked in every game. My advice would be, hockey is supposed to be fun so don't think about it too much and just have fun. It's just a game! TAN: I always see your younger brother at your games giving fist bumps to both teams going on and off the ice. What's it like sharing hockey with him? KB: It's cool that he likes to come and support me. It means alot to me! We are trying to save up some money so we can get him in the net soon. TAN: What fires your passion to continue playing? KB: I get better every time I step into the ice. I feel like if you live to play hockey and you keep getting better at it, why stop? I hopefully still have a good college career to look forward to as well. Thanks for the replies Kolby. I can't wait to see you on the ice soon! Check out some of Kolby's game here. 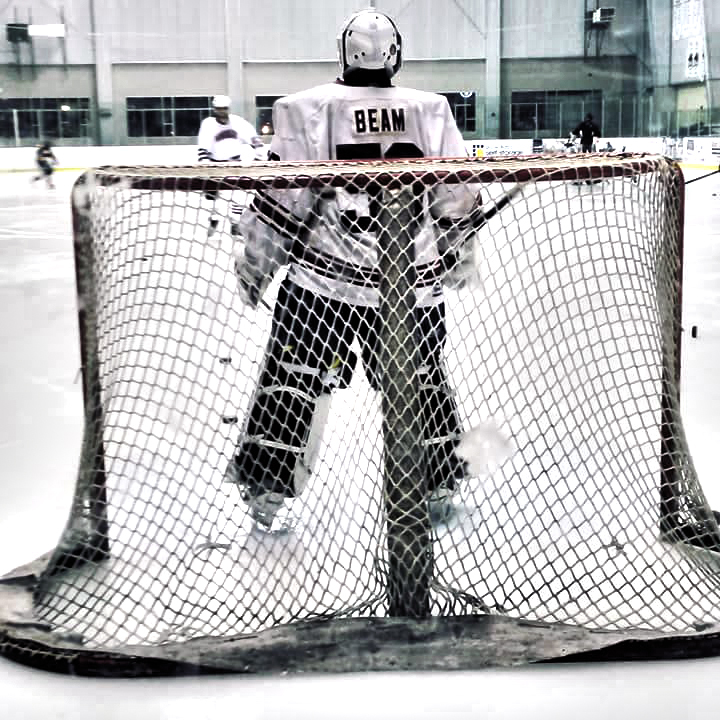 Would you like to read more local goalie profiles? Leave a comment below.